Soccer is one of the most popular sports played on a worldwide scale. Soccer players hairstyles often become iconic among their fanbase in their home countries as well as in the whole world. With so many different looks and personalities, it is interesting to try and follow the ever-changing world of soccer players haircuts. In the mid-1980s, and ever since many players adopted a mullet hairstyle. This was cut short in front and at the sides but left long in the back. It is still a popular hairstyle among soccer players today, though with more variations. Another style that is still gaining in popularity is the faux hawk. Based on the idea of a Mohawk, this style keeps the stripe up the middle of the head that stands up but also keeps short hair present on the sides and back of the head. These areas would be shaved to create a true Mohawk. A wide range of spiked hairstyles has been worn by many of the more popular players from around the world. Most simply look as if the player ran his fingers through his hair and called it combed. Of course, achieving this look and maintaining it takes a bit more effort than that. In addition to these somewhat standard hairdos for soccer players, many have experimented with shaved heads, cornrows, fade haircuts, single braids, and some haircuts that were way out there. What it really comes down to is personal taste, what style will work with a player’s facial features, and how best to keep the hair out of his eyes when he is playing. 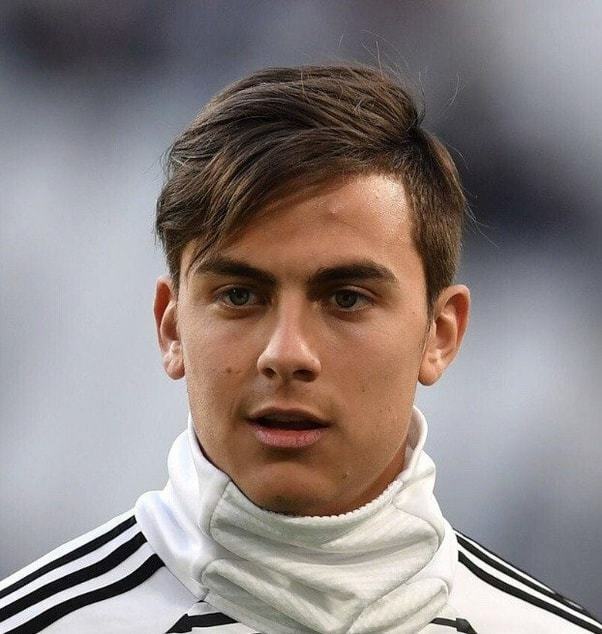 Our experts have carefully picked the best of the soccer players and the unique hairstyles they’ve sported for the football lovers around the world. Check these 20 soccer haircuts to rock your style. Foppish bangs can suit men of most ages and are a great way to add definition to otherwise very straight hair. This is a cute soccer hairstyles for players. How to Style: If you are bored of your lank locks and want to add some interest, keep the hair shorter on one side and leave the bangs to sit across the forehead. You can mix up the parting depending on what suits your face shape best. Sportsmen don’t all want to have short hairstyles, and this is a great easy maintenance option for those who like to keep it longer. How to Style: Layering is key here to keeping this look manageable and add definition. Leave the hair to dry naturally and tease back from the hairline with a serum to add gloss and tame any frizz. A high fade is a great way to get that easy maintenance haircut for soccer players but still keep some length on top. Ideal for: Heart, round, square and oval face shapes. How to Style: Aim for a high fade up above the temple, leaving some glossy length across the crown of the head. Adding a part will help create definition in the style. Keep errant hairs in place with a strong hold pomade. Not all mohawks were created equal and this soccer players Mohawk certainly has a style of its very own. Ideal for: Square, round and diamond face shapes. How to Style: By keeping both the sides and the mohawk sections quite short, this makes for a very low maintenance and easy up-keep style. Perfect for those who are playing and training for soccer games regularly. 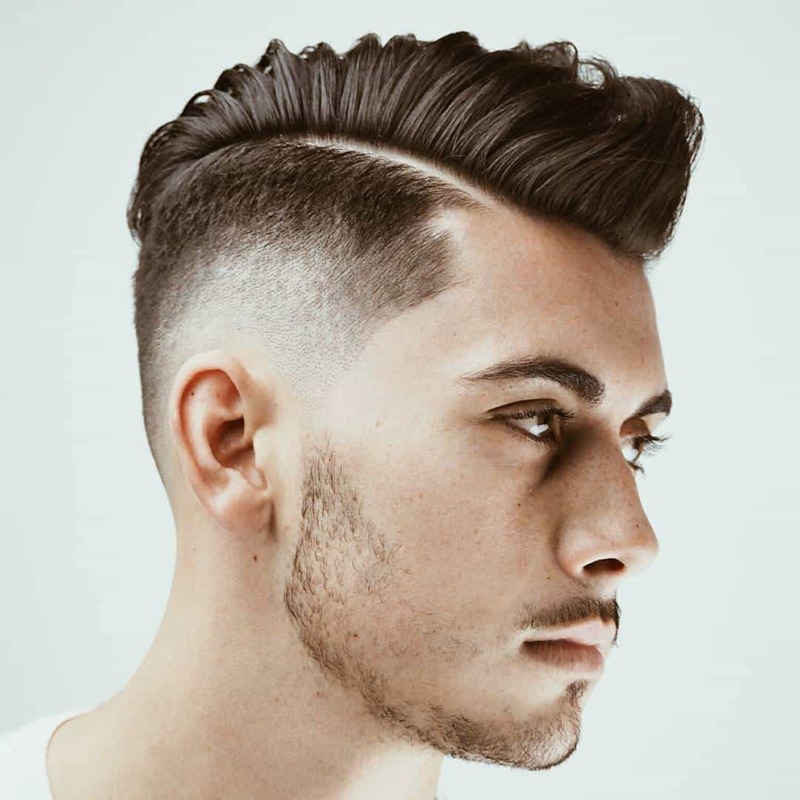 Go super short on the sides, adding a thick slice of hair across the crown down to the nape. For those guys who play soccer, you will likely want an easy cut but you will still want a stylish look off the pitch and this soccer haircut can give you the best of both worlds. Ideal for: Oblong, round and triangle faces. How to Style: Keep the back short and make sure you maintain that shape-up around the temples and sideburns for a super fresh look. Add layering into the length across the top and finish off with a high shine wax. Naturally thick and curly hair doesn’t always lend well to sport, with excessive washing and styling it can leave locks brittle. This doesn’t mean you have to miss out on a trendy style if you choose to have a shorter crop. Ideal for: Square, oblong and heart shaped faces. How to Style: This is a great cut that is really set off by the subtle use of a fade from the temples down. The clever edgy shaved line adds an extra dimension. A French crop is a classic and timeless look – however the longer fringe that tends to come with the crop may not serve you sports guys very well. Ideal for: Oval, square, oblong and heart shaped faces. How to Style: Take a modern twist on a French crop by keeping the bangs shorter but still blunt and add in a fade from the temples down to the nape for a very edgy look. There are so many options now when it comes to detailing on men’s hair, especially where shaved portions are concerned. 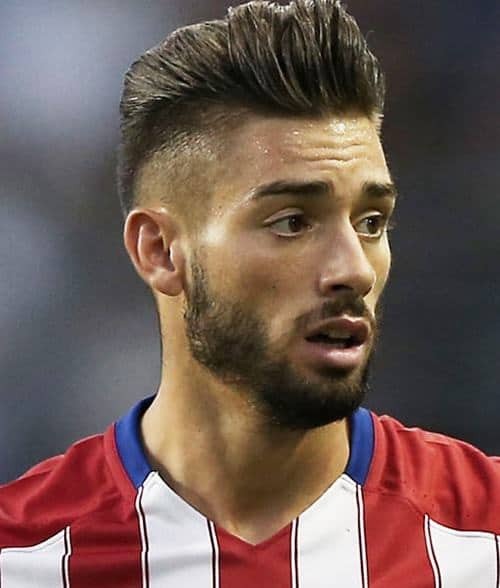 How to Style: This unique and very quirky soccer player hairstyle features cleverly shaved and dyed designs that all vary in length and size. This look would take some upkeep and a very patient stylist but your design options are endless. Naturally thick and curly hair pairs very well with a fauxhawk as it enables added movement and definition. If you want to turn your style up a notch, why not add some ombre tones? Ideal for: Round, square and diamond shaped faces. How to Style: By keeping the sides short and cropped, you can make this style far more maintenance friendly. Add a splash of ombre coloring through the lengths of the hair and wear it naturally curly and thick. For added contrast shaved lines or designing around the temples is a good move. David Beckham arguably was the hairstyle chameleon of the soccer world but could still rock a simple ‘do now and again. Short hair is the classic go-to cut for sports players as it’s an all-round easy look and simple to maintain. Ideal for: Square and oblong face shapes. How to Style: Go for a unassuming buzz cut with some shape-up on the sides depending on your hairline. This is a hyper easy look that is a great way to show off your facial features. Choppy crops always look cute and edgy when done well and are a versatile style that can be adapted to suit your face shape, and hair type. Ideal for: Oblong, triangle, diamond and heart shaped faces. How to Style: Layering is key to getting this look to sit well. Style the hair by adding a soft hold mousse and blow-drying using your fingers to position the hair and to get those waves and bangs in place. This slicked back look is very suave and gentlemanly and would be a perfect option for those maturing soccer players. How to Style: This look is versatile in that you can slick back the entire do or leave parts more natural if it suits your face shape better. Keep the sides well cropped and use a strong hold product to achieve that shiny and luxurious finish. Braids are great maintenance soccer styles that also serve to help you keep your tresses safe from damage. How to Style: There are countless options when it comes to braiding the hair so speak to your stylist or look around for something you really love. Consider adding shaved sides or defined partings to give your look more oomph. Another braided style but this hairstyle is a little more complex and will likely need the intervention of a stylist. How to Style: The hair is pulled backwards from the forehead into a braid which will not always suit every face shape but speak to your stylist to design a look that will suit you personally. The corn row style plaits across the sides of the head make for a great contrast. The man bun continues to ride its wave of popularity which is great as it makes for a perfect soccer haircut. How to Style: You can mix this style up as much as you want by varying the length of your undercut to suit your preference. If your hair is not long enough to secure into a bun then you can always opt for a top knot which requires less length. This is a great look and super easy to do as and when you need to for a game or practice session. How to Style: If you have hair long enough to tie back then you can pull the hair back into a low ponytail and secure with an elastic. Add some interest with a hairband – either a toothed band or plain band – which will give the hair around the crown some volume. Up dos and structured hairstyles are becoming a very classic go-to look for men, especially soccer players, so why not add a twist by adding some braids? How to Style: There are countless types of braiding available so speak to your stylist about what would suit you and your hair type. You can then either wear them loose or pull back into a messy and fun ponytail when needed. This quirky look is perfect for those guys who like to rock their long hair but keep it tied back for their sports and soccer games. How to Style: Pull the hair back into a ponytail and secure with an elastic. Run some serum across the crown to add shine and stop any unwanted frizz. High fade always means high style, especially when paired with a very trendy and fashionable quiff. This soccer haircut has been sported by many famous footballers! How to Style: To get that stylish quiff you will need to have around 4 or 5 inches of length in your locks. Keep the sides short and add a temper fade towards the nape. Get some layers cut into the hair to reduce any unnecessary weight and blow dry with a big barrel brush to achieve that volume. You have hyper glossy and shiny long hair so why not just show it off? How to Style: By keeping your hair in top condition and having regular trims you can protect against damage, split ends and frizz. So if you love your long hair then wear it proud and leave it loose! There is one common thread that ties all of these soccer players haircuts together. They are all short enough in the front to ensure clear vision when the player is out on the field while enhancing his looks for when he is off the field. Get inspired by these classic football player’s unique hairdos. What!?! Carles Puyol is not on this list? That man has the best hair in football!